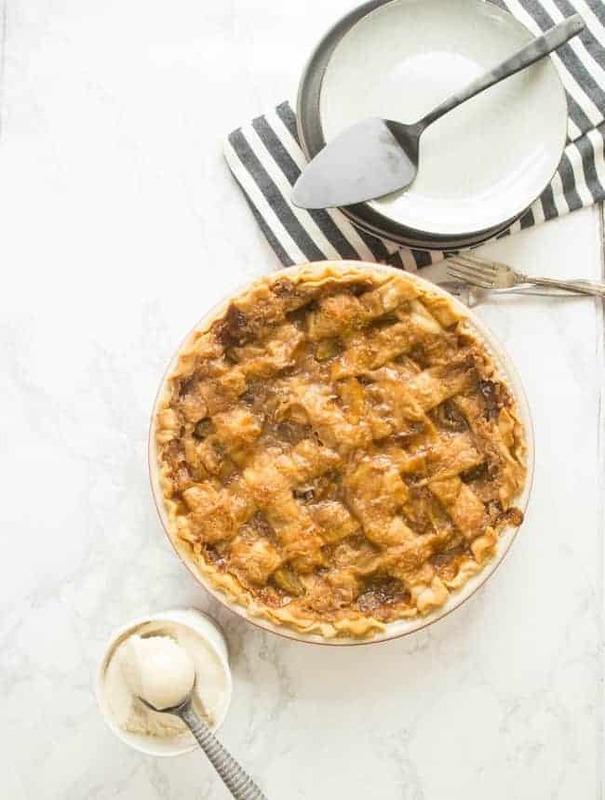 This Homemade Caramel Apple Pie is the absolute best apple pie I’ve ever eaten and really so simple to make! With all the compliments you will be sure to receive once you serve it, there’s no reason why you shouldn’t make it this holiday season! There’s just nothing like it, is there? All-American. Baked in a flakey crust. Topped with sweet vanilla bean ice cream. You know what I’m talkin’ about. Apple Pie. Absolutely nothing compares. Especially when it’s made fresh from your own kitchen. I don’t know about you, but when it comes to Thanksgiving and all the trimmings, pie is where you just can’t cut the corners. There’s no picking up the pie from the bakery. No ordering pies from a restaurant. And definitely no frozen pies in my Thanksgiving spread! It just doesn’t jive with me. Heck, I’d rather cut corners elsewhere – can anyone say ‘Stovetop Stuffing?’ Come.to.Mama!! Anything to allow me more time to make this delicious apple pie! I will tell you one thing about this particular pie. It’s like a fine wine. Yup, that’s right. It gets better as it ages. Seriously. Okay, well, unless we’re talking weeks here. But I promise you, it would never last longer than a week any household where tastebuds were present. Back to the point. So you make it on day one, preferably the day before you plan on serving it. It’s insanely soupy and has a thin liquid. Day two comes along and you can cut into it knowing you’ll be able to get a solid piece and the liquid has become more ooey gooey perfect for that perfect pie crust. And then the leftover pie. That, my friend, is where it’s at. Why don’t you just keep the fork right there in the pie pan because you’re going to want to dip right into it every time you walk past, right? You know – to save on dirty dishes of course. 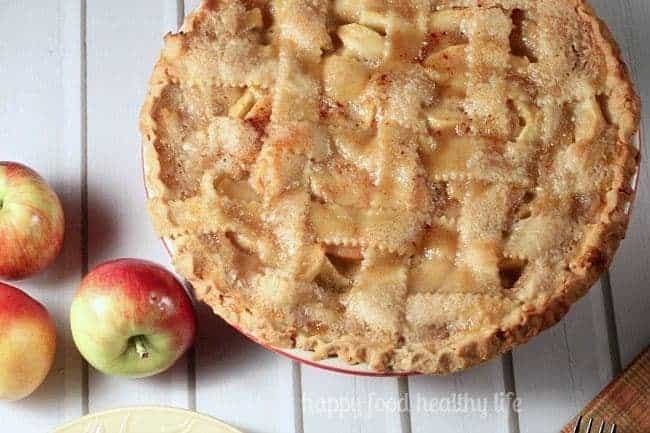 On second thought, maybe the easily accessible bites of pie numerous times a day isn’t the best bet – this is supposed to be a health blog, right?? But what I was TRYING to get at before my health-conscious self stepped in – the ooey gooey-ness continues more and more into the next couple days. The flavors combine even more. The crust becomes soft. Oh man. It’s just insane! 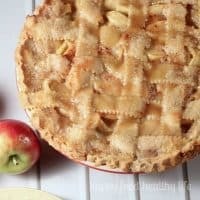 So before you decide to start placing your pie orders from Mrs Generic Cookie-Cutter Bakery, remind yourself that you can create a completely unique and ridiculously flavorful apple pie in your own home. But just beware. Making this pie for Thanksgiving will most likely put you on pie duty for the rest of your life. Just a friendly warning. Or hey, maybe you’re looking for a plant-based vegan version of this pie – let me hook you up!! The flavor is exactly the same and no one will know! This looks delicious. Stumbling, pinning, and making for Thanksgiving! Thanks for sharing. you’re going to love it! thank YOU for sharing! Wow this looks delish! 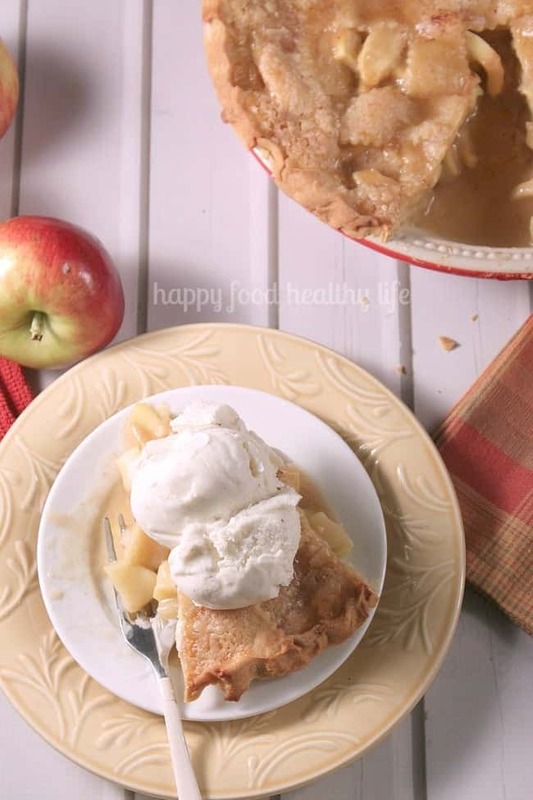 My hubby absolutely LOVES apple pie, and yours looks just perfect! I’ll have to try it on him. I don’t see anything mentioned about the caramel. What do I use to make it and how much? Thanks! This looks delicious. 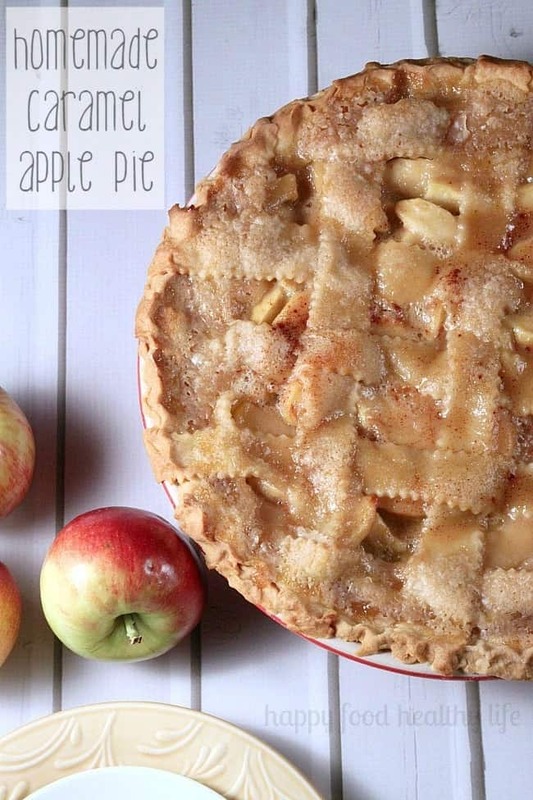 This pie is delicious and so simple! (especially if you use pre made crust like I did) You’re right about it needing several hours to set. The next day it was even better! It was perfectly gooey and delicious with some ice cream on top. Will be making this for Thanksgiving! I am so happy to hear that you tried and loved it!! YAY!! Can I use frozen sliced apples? Pam, I have never tried this pie with frozen apples. in fact, can you believe I’ve never frozen apples before! But google tells me that it can be done 🙂 Just be sure not to rinse away the flavor when thawing them. Instead, thaw in the fridge a couple days prior to using. Enjoy! I just made a caramel apple pie myself! Such a delicious treat and yours looks beautiful. Thanks Erin! It’s seriously my favorite recipe ever. Oh I am SOOOO glad you made and loved it! (although how could you not love it?!) It’s my go-to pie for every occasion, and everyone always raves over it. Hi! I have made this pie an few times now and we are all obsessed with it!!! I am having house guests this weekend and thought it might be fun to make these as individual pies…….have you ever done that? I am wondering how much the baking time would be affected? I’m so glad you love this pie! I make it a few times every year and everyone loves it. You know, I’ve never make it in individual servings, but that’s such a great idea. I wish I knew what the baking time should be. Definitely less. And maybe cover with foil halfway through so the crust doesn’t burn. If you try it out be sure to come back and let me know! As a pie novice, I have a few questions. Does it really not matter if it is a full top crust or lattice? Also should I cover the pie over night or just let it sit on the counter? I have never made a pie the day before serving. Thanks and can’t wait to try it!!! Hi Carin! You’re going to love this pie! 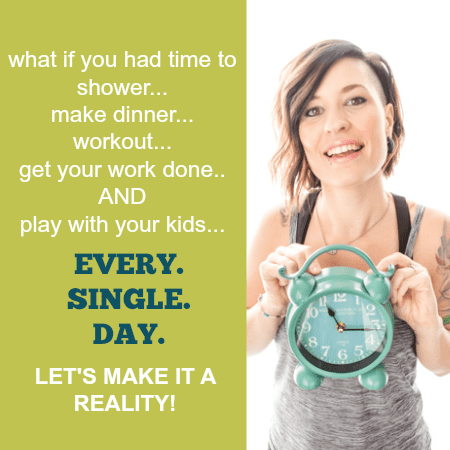 And you’ll especially love that you can make it the day before – I just leave it on the counter covered. And yes, you’re fine to use a full top crust if you prefer. Hi, I know this is an old post but just came across it on Pintrest and it sounds amazing! Just wondering do you know if cooking apples would work instead of Granny Smiths? This pie IS amazing – in fact, my family asks me to make it every single year. Any apples will work and be delicious. 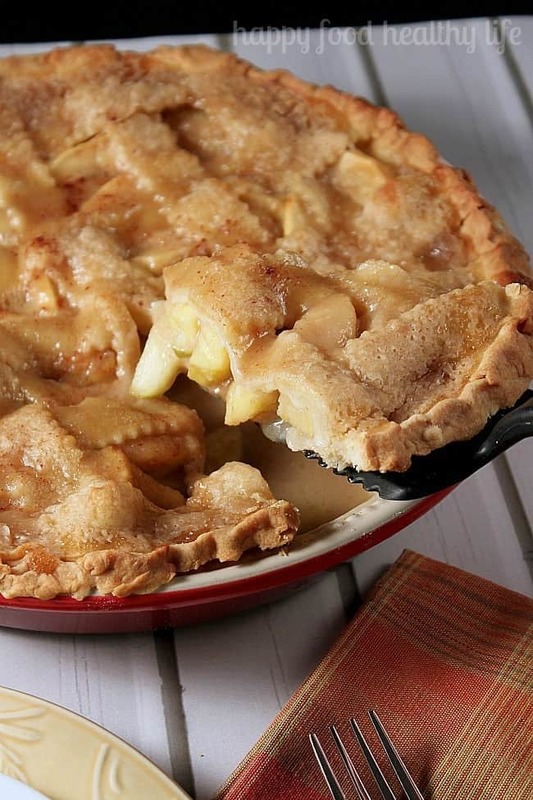 Granny Smiths are just classic for apple pie. You do what works for you. Enjoy! Should i cover the crust with foil? At what point do you refrigerate this pie or don’t you ? Hi Karen! I actually don’t refrigerate this pie. I let it sit out for a few days and it’s always just fine. I have made this pie twice and both times the caramel sauce mixture boiled out of the pie and dripped all over the oven. I love the taste but it’s been a cleaning nightmare to make. What can I do to prevent the bubble over from happening again? I’m so sorry your filling dripped all over the oven. Mine tends to boil over just a little bit. Tips: I always use a deep dish pie pan and I put the pan on a baking sheet to pick up any mess that boils over. Please don’t pour half of the caramel sauce over your pie and bake it, it will run over to your pan and smoke up your house and be a complete disaster to clean up. Just sayin. You’d be much better off just using half to three quarters inside the pie. I always use all the filling and just place the pie pan on a baking sheet to avoid the mess. My daughter wanted a Carmel apple pie for her birthday. I had no clue what to do my first thought was to put kraft camels in the pie. So glad I thought to look it up! When I seen the picture of your pie I knew I had to make this one! I have to say I can make a mile high apple pie. But this one blows mine away!!!! I will tell everyone about this recipe thanks so much! Is there a trick to making the caramel? Every time I’ve made it, there’s too much, and it bakes out into the oven. Hi Joe! I’m sorry you’re having troubles with the Caramel. I sometimes use a deep dish pie pan. If you don’t have one of those available, just place the pie pan on a baking sheet to catch any escaping caramel. Enjoy! I made this and it was amazing!! I like to make my pies very full, so my only recommendation is to use a deep pie dish. I used a standard size, but thankfully put my pie on a drip ring. I had to switch it out after the first 15 minutes as it was dripping over.